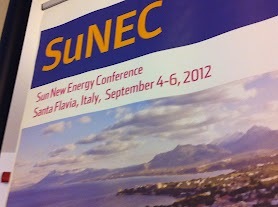 SuNEC 2012 took place in Sicily, Italy from 4-6 September and was deemed a great meeting by all involved. The scientific programme featured 6 plenary lectures, 14 oral presentation and 4 poster presentation that highlighted exciting innovation in widely different approaches to exploit solar energy, including concentrated solar power (CSP), thin-film photovoltaics, artifical photosynthesis and solar thermal. Eminent speakers at SuNEC 2012 included Aldo Steinfeld, Thomas Brown, Keith Barnham, Ruud Schropp, Bao-Lian Su and Kisuk Kang. EES is welcoming high-quality submissions from speakers at the conference, submission deadline 30 September 2012. More information.